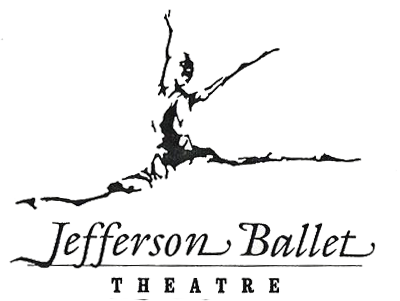 The Jefferson Ballet Theatre was founded in August of 1995 as a community based non-profit organization. Since its inception, it has contributed to the appreciation and understanding of classical ballet through professional, quality performances and educational programs. The Jefferson Ballet Theatre has earned respect in a broad based ballet community by presenting quality performances and hosting stars of the professional ballet world. It is an exciting place for young students to work right alongside the professionals. The Jefferson Ballet Theatre also enhances and enriches dance education by hiring some of the world’s most internationally renowned teachers, choreographers and dancers to conduct master classes which are open to the community. Under the artistic direction of Myra Mier, the Jefferson Ballet Theatre featured talented dancers who adhered to a strict standard of ballet technique and style. Because of these high standards, the Jefferson Ballet Theatre productions reached new heights of artistic achievement and audience attendance. The Jefferson Ballet Theatre held its first performances of “The Nutcracker” in December 1995, with eight performances in New Orleans, Jefferson Parish and St. Charles Parish. Since then, “The Nutcracker” was an annual event for the Jefferson Ballet Theatre for fifteen years. Spring performances, including original productions of “The Little Mermaid”, “Hansel and Gretel” and others, were tremendous successes, as were Gala events sponsored by the Jefferson Ballet Theatre. Last Summer, the founding director of the Jefferson Ballet Theatre, Myra Mier, decided that it was time for her to retire, to spend more time with her growing family. Her long-time associate, Kenneth Beck, and his wife, Kimberly-Matulich-Beck, an accomplished ballerina and respected ballet teacher and coach, assumed the positions of co-directors. They are committed to maintaining the standards of excellence that has become synonymous with the Jefferson Ballet Theatre name, but promise to take the company to a new level. In keeping with the atmosphere and expectations of today’s professional ballet companies, classes are based on both, the Vagonova syllabus and the Ceccheti method of ballet training. Students are offered classes in an encouraging and supportive environment, and much is expected of them. To emphasize their new perspective as company directors, the 2011 – 2012 ballet season, was full of new works. The Winter concert featured three new, original contemporary ballets: “Le Triomphe de l’ Amour” (choreographed and staged by Ms. Gayle Parmelee), “The Skaters’ Waltz” and a one hour long presentation of “The Snow Queen”. The Spring Concert went in the complete opposite direction, with a presentation of three ballet standards, original choreographed in the nineteenth century: “Pas de Quatre”, “Le Jardin” (from the full length ballet, “Le Corsaire”) and “Giselle”, Act II. The Jefferson Ballet Theatre receives an operating grant from the Louisiana Division of the Arts, Arts Council of New Orleans. Grant moneys have been used for the presentation of concerts in Jefferson, Orleans, Plaquemines and East Baton Rouge Parishes, and for the presentation of professional artists from the United States, Poland, Cuba, France, Russia and most recently the Republic of Georgia.